Munich - The Democratic People's Republic of Korea and Pakistan may be set to miss out, but the rest of the world will be tuned in to the biggest game of the Bundesliga season so far when Borussia Dortmund host FC Bayern München on Saturday evening (kick-off 18:30 CET). 207 of 209 FIFA-affiliate nations will be screening Der Klassiker live, and more eyes than ever before are justifiably focusing on the biggest show in European football. In May, for the first time in history the Bundesliga provided both finalists in the UEFA Champions League. Bayern gained the upper hand at Wembley, but Dortmund will be seeking revenge in this, the fifth meeting between two giants of the German game in 2013. Now more than ever before, they need the help of their fans. "Anybody who's got a ticket in their hands has a considerable influence," Klopp said. Indeed, the Schwarz-Gelben are without their entire first-choice back line and Klopp knows he's going to have to improvise on the biggest occasion of the season. "But the most exciting thing is creating something special out of a problematic situation," said Klopp, ever keen to rise to the occasion. "We want to create a game in which each time we win the ball, there are frenetic cheers. We’ve still got huge quality." The grass is not necessarily greener on the other side, however. Bayern arrive without UEFA Best Player in Europe and leading Ballon d'Or candidate Franck Ribery. A rib injury sustained while helping France book their ticket to the 2014 FIFA World Cup deprives the Bavarians of a key element of their attack. "It's a big shame for the player and of course it plays a role for the coach too," Guardiola said on Friday in Munich. Nevertheless, the Catalan is not one to cry over spilt milk, and he will not accept anybody doing such. "I hate excuses," he said. "I have said very often that injuries are no excuses." Like Klopp, Guardiola would rather take it on the chin and do the best he can. "I'm sorry for the injured players, of course, but other players have a lot of experience too," he added, before defining Dortmund as "a top team" with "extraordinary quality", even if Mats Hummels, Neven Subotic, Marcel Schmelzer, Lukasz Piszczek and Ilkay Gündogan will only be seen in the stands at the Signal Iduna Park. There, they will be joined by over 80,000 spectators, and the imposing Gelbe Wand providing an atmosphere worthy of the occasion. In Klopp's words: "Every time you walk out onto the pitch it's like being born again, except with a lot more applause. You come out, and it just explodes." It may be said it is comparable to the Iberian equivalent El Clasico, yet Guardiola, veteran of many FC Barcelona v Real Madrid CF duels, expects his first Bundesliga battle with Borussia to be even tougher. "If I were to compare, then I would have to say that Dortmund are a better counterattacking side than Real Madrid," Guardola said. 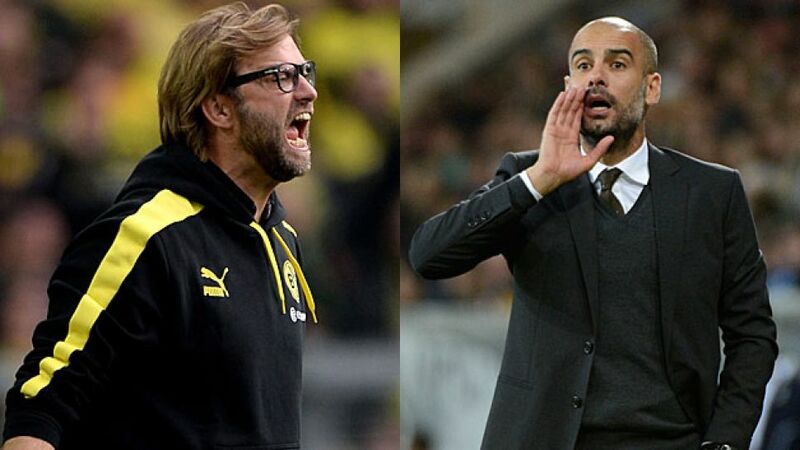 "And Jürgen Klopp is one of the best coaches in the world. We're going to need a lot of courage." If you cannot wait until Saturday night and you want to know how the game will end, then let EA Sports give you a peak at what can be expected on Saturday night with this simulation on the Bundesliga's official YouTube channel.